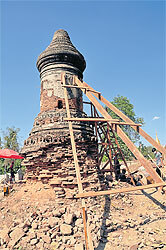 A team of archaeologists and architects believe the remains of a former ruler of Ayutthaya may lie in a Myanmar stupa. But will the truth remain a mystery? It was late afternoon on a hot day in Myanmar. A group of Thai archaeologist at an excavation site in Linzingong cemetery in Mandalay were about to wrap up their work when one of them emerged with a lotus-shaped artefact. Every day, some 30 people would be seen working at the site. Some were seen digging into the ground, while others were digging into the centre of the stupas. Myanmar historian Mickey Heart was there to help with historical details. 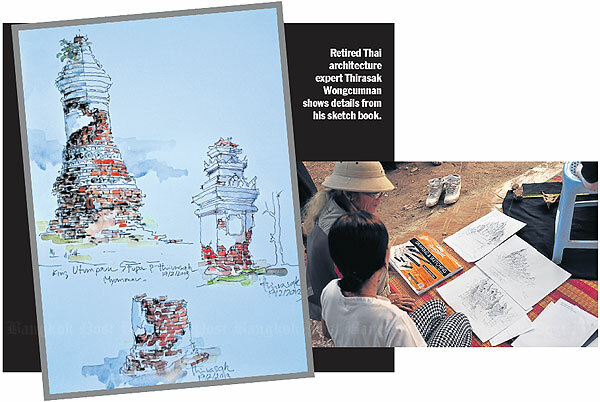 Retired architect Chantharid Virochsiri analysed the stupas, while two engineers ensured safety on the site. These veterans were supported by young professionals. The small discovery brought joy to the group _ a band of independent archaeologists who volunteered for a project supported by Association of Siamese Architects (ASA). 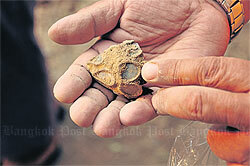 Their mission was to verify royal relics of an Ayutthaya king on Myanmar soil. "We are taking another step closer to achieving the mission," said Patipat Pumpongpaet, a retired archaeologist, as he carefully examined the piece. The site they worked on is an abandoned cemetery where three ancient stupas are located. Some believe that one of the stupas holds relics of King Uthumporn (1730-1796) who reigned the kingdom shortly before leaving the throne to his brother King Ekathat, the last king of the Ayutthaya period. The lotus-shape artefact found in the small stupa. King Uthumporn, then ordained, was among Thais who were abducted from Ayutthaya and settled in the area that is now Myanmar. The king died in 1796 while still in the monkhood. According to the Myanmar chronicles Parabike, King Uthumporn was captured along with some 30,000 villagers when Ayutthaya fell to Myanmar in 1767. They were taken to Innwa, about 20km outside Mandalay, where the Yodia captives _ that is how Ayutthaya was known in Myanmar _ were allowed to build homes. King Uthumporn, better known as Chao Fah Dok Maduea, was believed to reside initially at Maha Theindawgyi Monastery and later moved to Yethaphan Kyaung Temple, before Paung Le Taik Temple where he remained a revered monk until he passed away. The search for the king's relics began last year when the area, which is close to the famous U Bein wooden bridge, was designated for a development project. 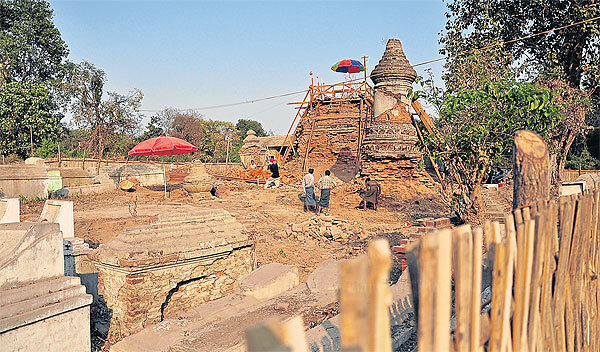 Under an initial plan, the three stupas were to be torn down and their artefacts would be relocated to a new site at a temple about 300m from the cemetery. But the project was eventually suspended as the Myanmar government wants to preserve the historical site. Architect Vichit Chinalai, who led the excavation project, discovered the stupa about 20 years ago when he visited the site as a tour leader for the ASA and has always wanted to solve the historical mystery. Initially, his team was instructed to remove all the finds to the new site and decided to use the anastylosis technique to verify the tomb, which means every piece of brick would be removed for the team to dig inside each stupa. But the team embraced the decision of the Myanmar government to preserve the stupas. "Whether the stupa could be verified or not doesn't matter anymore," said Vichit. Vichit is not the first person to look for King Uthumporn's relics. The urn-shaped stupa, which is considered the most majestic in the area. Prince Damrong, one of Siam's most famous and knowledgeable historians, visited Myanmar in 1936, and tried to locate the stupas which "had been mentioned by King Rama V". The issue re-emerged in 1995 when Dr Tin Maung Kyi, an amateur historian and Yodia descendant, tried to convince readers in Today magazine that one of the stupas belonged to King Uthumporn. However, the stupas have since attracted debate. Some modern-day historians refuse to believe they have any connection with the Ayutthaya king in the absence of inscriptions or other historical evidence. But the chronicles indicate the area was the cremation site for the king and a stupa was built there right after the royal cremation. The site was part of a cemetery for foreigners, including Westerners and Yodia, in Myanmar at the time. It was found that the two of the three stupas were built in the same period, said Vichit, judging from the size, form and texture of the bricks. The shape of the small stupa also resembled an urn, which is usually used only in a royal cremation ceremony. "There's no other stupa more majestic than this one in the area," he said. More than two centuries later, Yodia traits can be found in the surrounding temples. Apart from the visible architectural traits, the team discovered the three stupas in the cemetery were surrounded by smaller tombstones from a different era located inside an enclosed four-sided wall hidden underground. The layout suggested that the cemetery belonged to a very important family, said Vichit. The volunteers also found the lotus-shape lid handle in the small stupa to the northeast of the main one. Two days later, a container was found deep inside the same stupa. Like the handle, the exterior clay bowl resembling a monk's bowl was decorated with drop-shaped glass mosaics, encircled with gold lacquer. Inside the bowl were a few pieces of burned ashes and a piece of tooth. ''No commoners would have such a container in the old times, no matter how rich you were,'' said Patipat, sweating under his dusty sombrero. He admitted the discoveries without any inscriptions couldn't verify that the tomb belonged to King Uthumporn. The container could only be linked to a revered monk. Patipat also tried to link the container to the Yodia-style mural painting at Kyauk Taw Kyi temple, which features a deva holding a bowl on a tray. The team has wrapped up the project and is to present its findings to Mandalay later. Vichit hopes to start the second phase of the project soon. The new phase is to renovate the site for Thai descendants visiting Myanmar to pay homage to their Ayutthaya king, and to build a replica Yodia village, linking the cemetery with the famous U Bein Bridge with a lakeside promenade. Retired architect Chantharid Virochsiri, also a volunteer, hoped the area could be turned into a promenade featuring a small car-free lane for the locals to continue with their conventional transportation with horse or cow pushcarts, and for tourists to use. Commercial buildings or hotels of an appropriate size could also be established if the state wished to earn an income from the area. Waste management should be improved _ the villagers shouldn't be dumping dye waste directly into the lake. ''The site could become a role model for other communities in Myanmar and even Thailand to follow,'' he said. The historic tomb, meanwhile, will remain a mystery. ''Although the tomb couldn't be verified, we will bring back the missing parts of King Uthumporn's life that have never been recorded in Thai history,'' said Patipat.